After a temperate Victoria day long weekend, mother nature stomped on the gas and by the 28th we had heat warnings with a humidex of 35-38°C. No big deal for us though! HAFTA packed up the coolers, lawn chairs and umbrellas and headed over to Hilton Falls. 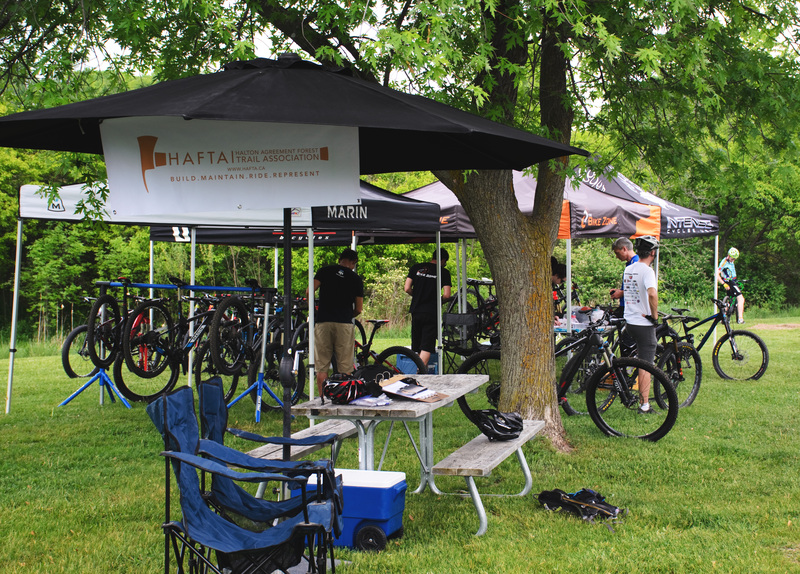 The Bike Zone and HAFTA had set up shop at in the conservation area’s parking lot shortly after 3pm with major brands on tap that day such as Kona, Marin, Felt, Scott and Intense. Put the feet up. This is much easier than trail day! Almost a drenching! It was humid enough though. 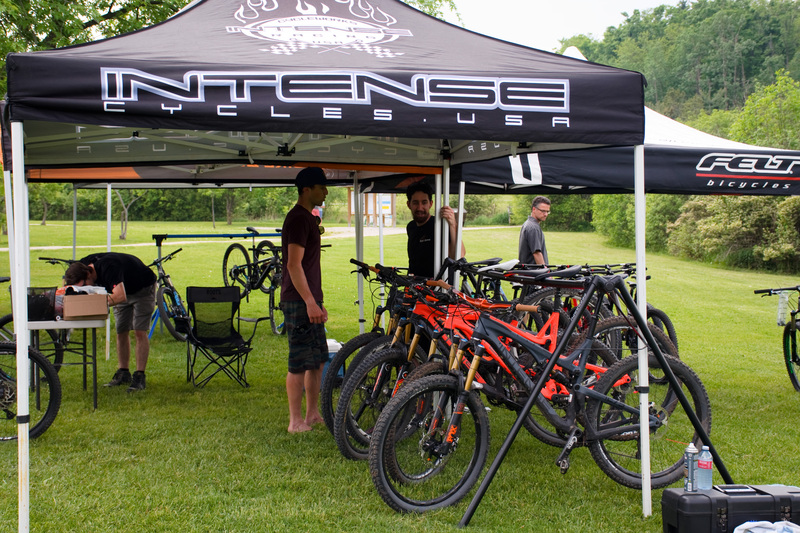 We’ve got a few pictures of some of the bikes available to demo. Most were high end models with all the trick bits. You won’t get a chance to try out a collection like these bikes for a while so apologies if you couldn’t make out. 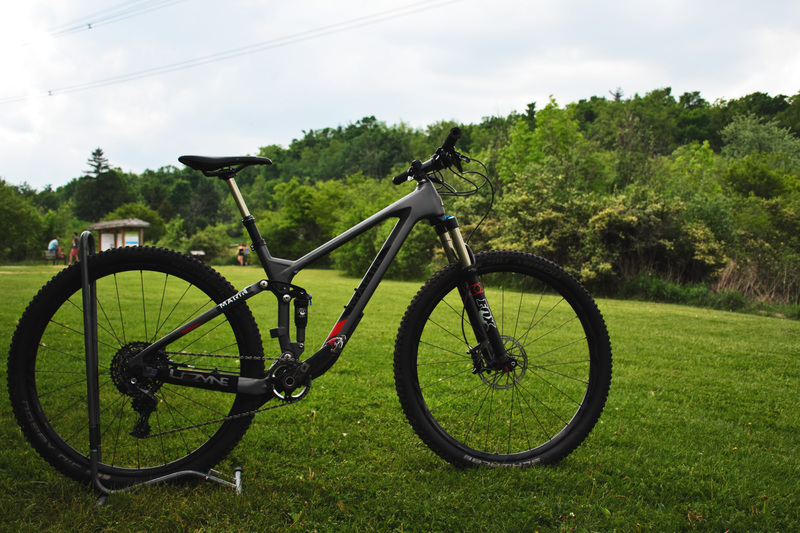 The selection available involved 27.5 all-mountain/enduro bikes, a few trail orientated 29r and 27.5+ bikes in the mix. I think there was even a fat bike. All sorts of carbon fibre. Since the demo was first come, first serve things got going pretty quickly. 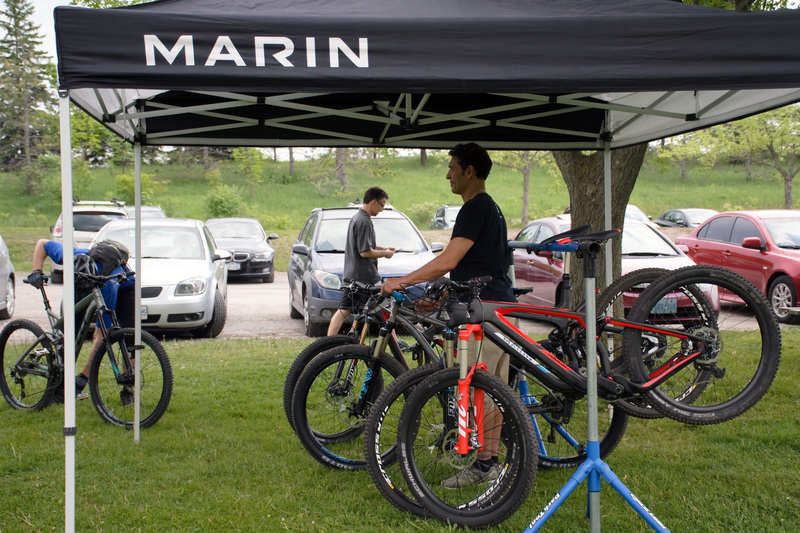 A few eager riders arrived early to ensure a test ride on the models they were interested in, but things were chill enough that eventually riders got a chance to try whichever model they wanted. As soon as the riders were ready to go our Accountant and Vice guided them to the trail-head. The route involved a short climb out of the parking lot, this offered a chance to see how the bike pedals uphill and then it was right into the rocks on trails like Bent Rim 1 to see how the bike handles the chunky tight single-track that comprises the majority of Hilton Falls and the Agreement Forest. The terrain here really offers a unique spot to test out longer-travel bikes. Can we get a keg next time? Trails were hot, but they were still dry for the most part as the canopy had shrugged off the light sprinkles of rain we’d received from the odd cloud. Towards the end of the demo the warm front seemed to break with temperatures cooling down rapidly. On cue a nice breeze provided optimal conditions for sitting around post-demo. 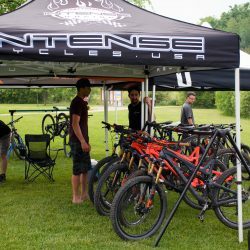 Good times, assorted swag for riders too! We hope our sponsor and members found this a worth-while event. 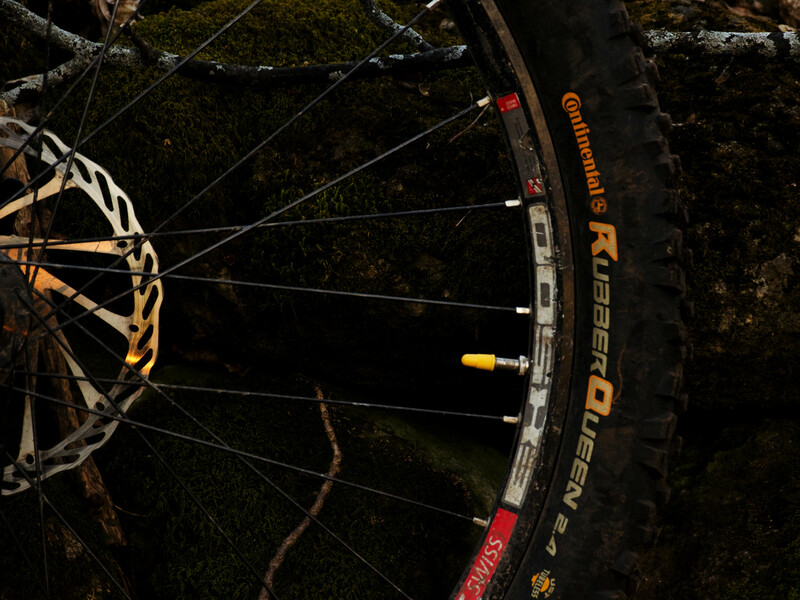 It doesn’t get much better than a free demo on your home trails with swag included. Let us know in the comments if you have a thought about it? 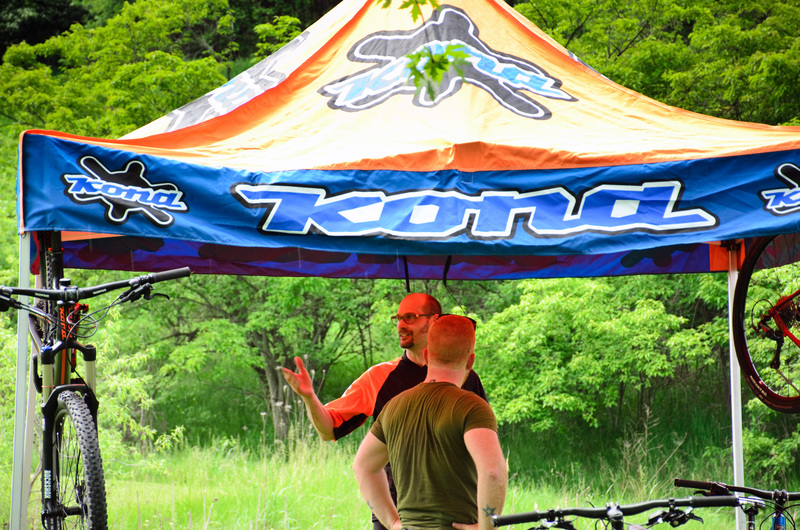 We know it was short notice and normally we’d have the event at the Mohawk area, but we tried and they were booked. 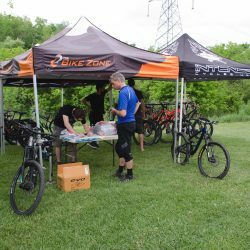 Remember to check out The Bike Zone in Mississauga, they are helping to keep trails running smooth and carry all sorts of bikes and kit that is capable in the rocky terrain in Halton. 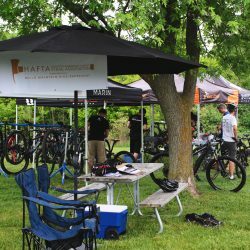 Plus since you’ve got a HAFTA membership card you can score a discount! Settling into the spring riding season in the Agreement Forest has taken some time this year. The first snag came hot on the heels of our AGM. Just as we were escaping March old man winter laid down an impressive ice-storm on the 25th. 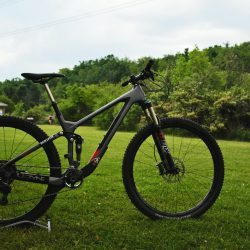 Many riders were worried we’d have another catastrophic storm like 2013 – A storm that saw lesser used trails so heavily clogged with fallen trees they never recovered. In the end this new storm was nowhere near as damaging, but it still wasn’t messing around as it brought accretions of ice ranging from 10-20mm. That is a lot of ice, but in a stroke of luck for our trails, there was a lack of wind and a prompt warm front following which allowed trees to quickly shed ice. The thing about warm fronts is that they aren’t all sunshine and lolipops. 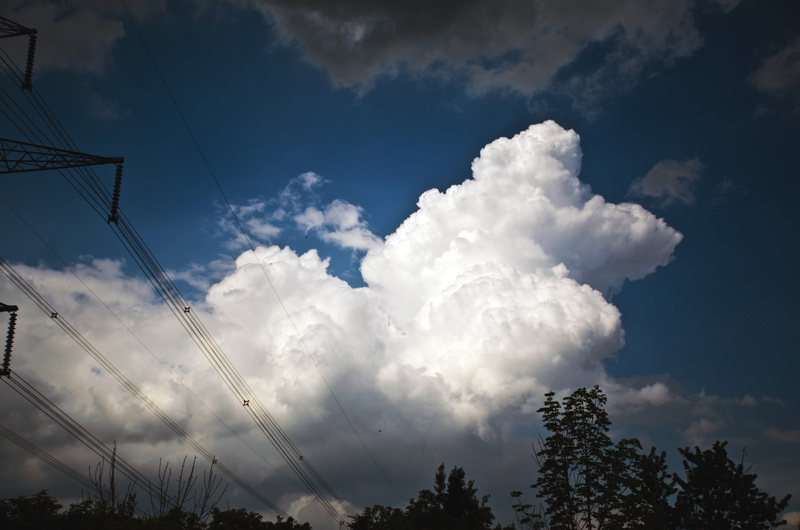 Just a few days after the ice storm melt we saw a new front that caused temperatures to rocket to 17°C. 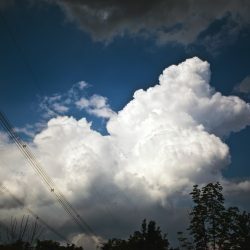 The worst part of this storm was it poured about an inch of rain in one go. That rainfall caused rivers and streams already swollen with melt-water to overflow and flood the trails. Before anything could dry up we plunged right back down into winter with nightly lows in the double digits. It was thusly that the trails became a half frozen slurry of mud and ice as we oscillated around the freezing point for what felt like weeks all the while politely asking users to stay off the vulnerable trails. It wasn’t until April 20th that we decided the trails would be able to handle regular traffic with minimal damage. Unfortunately some had people ignored the previous warnings so our trails gained more soft spots and deepened the older ones. Those same riders took the opportunity to cut themselves a new trail off of Christmas trail which we had to close. Not only because the land owner hadn’t agreed to it, but also since it went through a patch of green violet the ecologist had identified earlier. 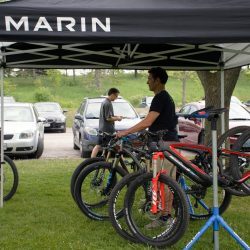 After the debacle of early April and with temperatures rising, riders were really ready to get outside so they turned in force on April 26th to help open up the trails for the season. This was the first of three maintenance days to occur. It was job well done in Hilton Falls, but the work was not over. We still had to deal with issues on our side of the forest complex. On the 30th of April we hosted the first HAFTA led build and maintenance day. Two main projects were to be tackled, the first of which involved giving the pines a much needed tune up and pruning as this section had not been up to snuff since the logging. 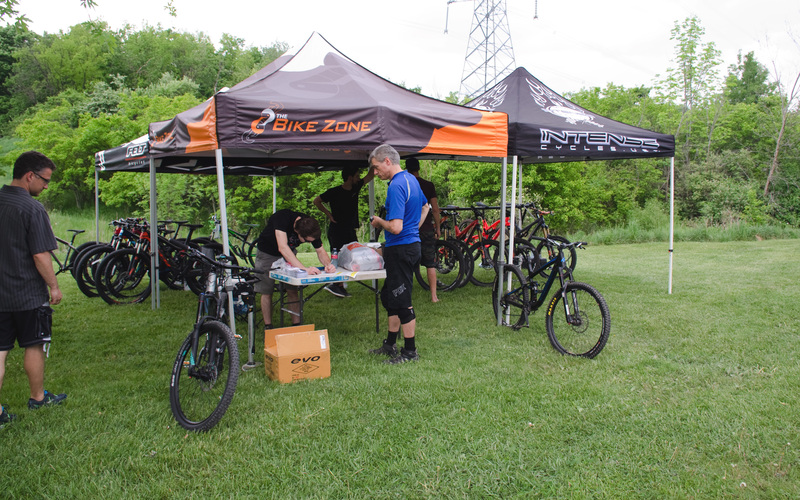 Before this got started we went out and spent about $500 on tools and Spokes and Slopes generously matched that amount with their donation bringing the purchase up to a cool $1,000. Big shout out to them for the help in the trail department. Next came the small issue of closing the extra lines at the Bat Boxes. Not a popular project, but things are always a negotiation and this one was requested by the land owner after the results of their five year survey were returned to them. 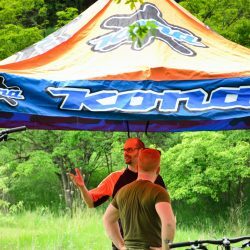 The last build day of the spring season took place April 1st and the people who came out weren’t kidding around as the weather had taken a turn for the wet after the previous day’s sunshine. On the agenda was sitting and drinking coffee and hoping that nobody would come out, but we should have known better as mountain bikers aren’t afraid to get a little dirt under their fingernails. The first task was to armour the lead in to a low spot we had previously board-walked on the B.C. Rocks trail. Up next was redoing the rock-work on the “Easy/Hard” section of B.C. Rocks. Ever since the wooden feature rotted away and broke it didn’t ride too smooth. We’d like to thank the volunteers who turned out for out build and maintenance days! Each volunteer helps to motivate us and when people show up on a rainy day we can’t help but feel the future of these trails is bright. Hope to see everybody out enjoying them!